Colorful Impressions: The Printmaking Revolution in Eighteenth-Century France, National Gallery of Art, Washington, 2003-2004, no. 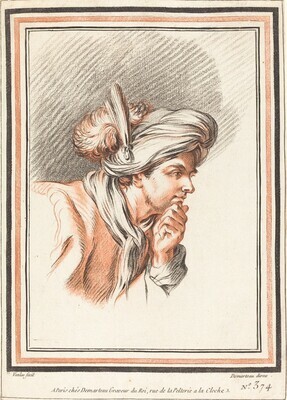 23, as Head of a Man Wearing a Plumed Turban by Atelier of Gilles Demarteau the Elder after Carle Vanloo. Leymarie, L. de. L'Oeuvre de Gilles Demarteau l'aine graveur du roi, catalogue descriptif. Paris: Georges Rapilly, 1896: no. 374. Thom. Agnew & Sons, London: 5/28/86-7/25/86, no.42. Colorful Impressions: The Printmaking Revolution in Eighteenth-Century France. Exh. cat. National Gallery of Art, Washington, 2003-2004: no. 23.